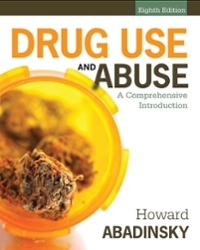 Drug Use and Abuse 8 Edition Packed with the latest data and research, the powerful new DRUG USE AND ABUSE: A COMPREHENSIVE INTRODUCTION, 8e delivers a thorough, interdisciplinary survey of all aspects of drug and alcohol abuse. The text draws from the many disciplines of history, law, pharmacology, political science, social work, counseling, psychology, sociology, and criminal justice--resulting in the most comprehensive, authoritative single source available. The author explores the history of drugs, their impact on society, the pharmacological impact of drugs on the body, drug policy implications, the criminal justice system response, the drug business, law enforcement, theories of use, as well as the effects, treatment, and prevention of abuse. New coverage includes nonmedical use of prescription drugs, synthetic substances, the use of stimulants to treat PTSD and ADD, medical marijuana, the connection between drug trafficking and terrorism, and an updated analysis of the United States drug policy. Available with InfoTrac Student Collections http://gocengage.com/infotrac.